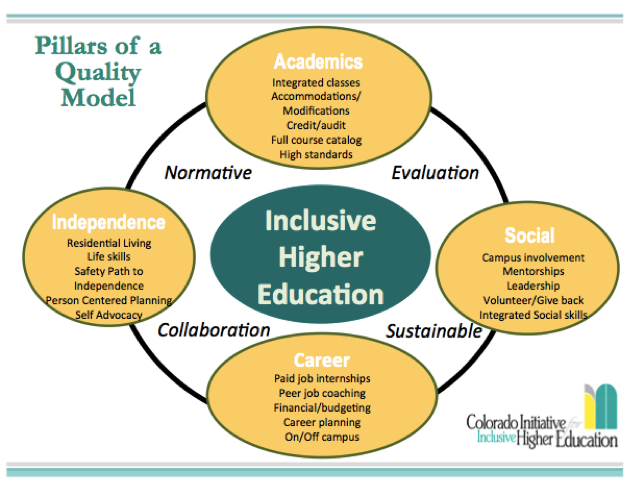 This section outlines the components of inclusive higher education. College is about more than academics. It also includes career preparation, socialization, and independent living. Inclusive higher education is designed to support students in all of these entities. Please note, as inclusive programs, these supports are run by each school. IN! advocates for the establishment of supports and provides some oversight, but does not provide direct services to students. You can download an information sheet to share with families here. Senate Bill 16-196: This bill outlines the parameters for inclusive higher education in Colorado. IN! 's Inclusive Model page: Here we summarize admission requirements and program overview for each school. Think College website: Think College is the national coordinating center for inclusive higher education. There are many strategies and tips to prepare students with disabilities for college. Here we've highlighted some top tips based on national research as well as personal experience. The main things to keep in mind are 1) your beliefs have a great impact on the student (many students with intellectual disabilities are never asked if they've thought about going to college and 2) preparing for college goes beyond academic preparation - it includes social skills and independence. Discuss disability: Support the student to learn how their disability impacts their life. Help them define the connection between the disability and the supports they may need in the future. Engage the student in the IEP process: Through leading their IEP, students can begin to develop their self-advocacy. In addition, you play an important role in educating students and families about the college options that exist and directing them to resources to learn more. It is important for students to understand they will not have a case manager in college who helps them the way that you do (please note, students enrolled in inclusive higher education do still have someone who manages their case, but we want to encourage students to be as independent as possible). Click here for a list of IEP goals related to transitioning to college. Connect the student to IN! 's resources: We have a resource pages developed for students to learn about preparing for college and the options available. Click here for the student page. If there are other resources that would be of use to you and/or your student, please let us know. Relevant skills: Some of the top college readiness skills include: soft skills, communication skills, use of technology, time management, study skills, safety and appropriate behavior, and navigation and travel skills. Assistive technology: Assistive technology is different at each institution. To provide students with the greatest choice, we encourage the development of general skills that are transferable between institutions. For example, teaching students to advocate for their own assistive technology need and developing competencies with free systems such as Google applications. Here is a checklist to help guide students to learn about what is offered at each school and inform what might be the best fit for them. 3. Involve others in supporting your student! College tours: Advocate for the inclusion of students with disabilities in college tours or fairs held by your school and/or district. Make connections within your school: Other professionals might not readily think to include students with intellectual disabilities. If your school offers college counseling sessions to students, advocate for the same for your students. Also consider what clubs, sports, or other extracurriculars might support your student to prepare for college. Connect students to outside supports: Involvement in the community can help prepare your student for college. Think about connecting them to college and career counseling, community based experiences (i.e. internships, volunteer positions), or other organizations as needed. As an educator, you play a big role in your student's life. We thank you for taking time to read through this information and investing in inclusion. Navigating the Transition from High School to College for Students with Disabilities (Grigal, Madaus, Dukes, & Hart, 2018) Student Resource Guide includes a college readiness assessment, college action plan, and college prep checklist. Download it here. For students who benefit from audio-visual modalities, IN! has put together playlists on YouTube about students with intellectual disabilities attending college in Colorado and nationwide. Many other benefits exist! Check out ThinkCollege.net to learn more. Depending on your field, this could be used as an opportunity for professional development hours. Coming soon: Attend a monthly webinar hosted by IN!